The ServSuite Mobile App is a complete companion to ServSuite software, making it possible for users to go paperless with work orders and proposals. 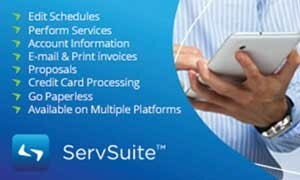 It allows you to manage your schedule, view account information, track usage, email or print invoices, and do credit card processing — all while easily synchronizing your mobile device with the ServSuite web application. In the Mobile App, you can view your scheduled routes and scheduled work orders for these routes. Take advantage of the ServicePro Mobile Bundle offer to get the Mobile App and a tablet device for one low cost per month, per device.